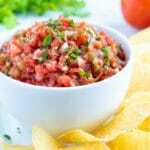 This Homemade Salsa Recipe is absolutely addicting and a super quick, easy, and healthy Mexican dip to serve with tortilla chips for a party. Learn how to make restaurant style salsa with fresh tomatoes, cilantro, jalapeños, and onions in under 15 minutes! In the bowl of an 11-12 cup food processor or high speed blender add all prepared ingredients. Pulse salsa 20-25 times for a chunky consistency or 25-30+ times for a smoother salsa. Serve salsa with tortilla chips, on chicken, or use it in your favorite recipe. Refrigerate salsa for up to 1 week in an airtight container. If you only have all fresh or all canned tomatoes, feel free to use that instead of the combination. When preparing your tomatoes you can choose to remove the seeds or keep them in. Remove seeds for a chunky salsa and leave seeds for a thinner salsa. One jalapeño will give you a mild salsa, two jalapeños will give you a medium heat salsa. If serving salsa with salty tortilla chips, err on the side of not adding too much salt.